A very important new study that throws much-needed light on armoured warfare on the Eastern Front during the final months of the war Days of Battle describes a hitherto neglected part of the military history of Hungary during World War II. 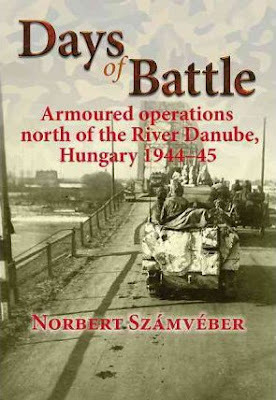 In three separate studies, Dr Norbert Számvéber, drawing from files and documentation from German, Hungarian and Soviet sources, presents detailed accounts of four important clashes of German-Hungarian and Soviet armour north of the river Danube, in the southern territory of the historical Upper Hungary (part of Hungary between 1938 and 1945, at the present time now part of Slovakia). The first is an account of the battle between the Ipoly and Garam rivers during the second half of December 1944, in which the élite Hungarian Division Szent László saw action for the first time. The second study is about the fierce tank battle of Komárom, fought between the 6 22 January 1945. This was an integral part of the Battle for Budapest, parallel in time with Operation Konrad. The third part of the book describes the combat during the German Operation Südwind in February 1945 and the Soviet attack launched in the direction of Bratislava in March 1945.